A 14 year-old girl's father is murdered and she intends to bring the killer to justice. While in town to settle her father's debts and arrange for his body to be sent home Mattie Ross hires a drunken U.S. Marshall who is known for his grit to help her hunt down the man that killed her father. Joel and Ethan Coen have built quite the catalog of films detailing the various dialects of America. Never the particular but always the peculiar, the Coens' have shown us time and time again their ability of illustrating the different voices of American culture in tremendous fashion. 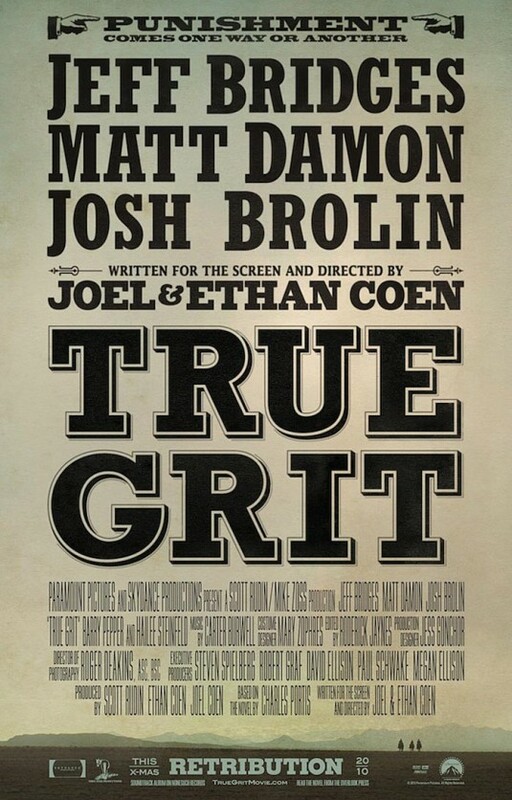 With "True Grit," the brothers Coen have added another notch in their noteworthy dialect belt. They've given us a expertly peering into a period of history that is not focused on nearly enough anymore. The Coen brothers with "True Grit" have displayed a staggering depiction of raw authenticity. It is fairly common to see the western genre have the right look, but to have the right sound and overall tone is not so common. 'Grit' is precise and powerful in every regard of displaying its authenticity. From the dialogue to the settings and everything in between is done in tremendous fashion. Overall the 110 minute drama is an exhibition in powerful. Powerful direction. Powerful cinematography. Powerful storytelling. Powerful dialogue. Powerful music and let us not forget powerful performances. Continuing to focus on the dialogue, Joel and Ethan Coen have magnificently retold a story brimming with enthralling deliberation. As any film watcher should be able to see, the Coen's know their way around words and here in "True Grit" they hit a home run for discourse. The film is and the dialogue within comes across much of the time as negotiation. Whether it is Mattie Ross in negotiation over her father's business affairs or Rooster Cogburn and LaBoeuf's constant bickering over who is a better lawman, the banter penned by the Coen's is immaculate. I'd like to make specific note to the lack of swearing. The dialogue throughout is colorful, witty and dirty. It is serious where it needs to be and hilarious when it chooses to be, though never is foul language used. Foul language doesn't bother me in the slightest. Used in the right way it can generally have a lasting effect, but the Coen's script is able to leave just as much impact as a four lettered word would, without any. In actuality the words penned come across with even more resolve. The language used is impartial and filled with just as much tenacity and spirit as I've become accustom to the Coen's displaying. It is absolutely brilliant. The words penned by Joel and Ethan Coen are potent on their own, but the actors that delivered the script are unerring in their portrayals. The entire cast is distinguished, however one actor stands above the rest. That is newcomer Hailee Steinfeld as Mattie Ross. Steinfeld not only holds her own against two Academy Award winning actors, she up-stages them in a number of scenes. "True Grit" is not so much a story about a roughneck drunken Marshall, its about a 14 year-old girl proving she has the fortitude that everyone tells her she lacks. Haliee Steinfeld takes a hold of this role much like the horse she must ride and never looks back. Steinfeld deserves a nomination for her staggering performance. She shows a rare ability to come across completely capable yet remains vulnerable like a little girl should be. Just like her character Mattie Ross in the movie, Steinfeld has earned her spurs in acting with this prominent performance. Jeff Bridges does not disappoint as Rooster Cogburn. Bridges is a veteran actor who has repeatedly masked himself in a number of roles and here is no different. Bridges comes across as both a farce and grave. Cogburn is a drunk and getting up in the years, but at the same time he is still wise and just as resourceful. Bridges plays every facet of the character precisely. He's both daft and dignified. He delivers the Coen's dialogue with ease. His drunken slur may be hard to decipher at first, but once his role is developed I found him easy to understand. One of the most enduring angles to Cogburn throughout "True Grit" is his storytelling. At first he seems to only be rambling on, but as the story progresses all of his tales are his way of opening up to Mattie. The bond that develops between Mattie and Rooster is handled very delicately but ended up having a very powerful affect on me. Something that can be equally attributed to the Coen's powerful script as well as Bridges and Steinfeld's captivating portrayals. To break from the acting for a moment, Carter Burwell's score is a slice of Americana heaven. The music immediately sweeps the viewer back in time but, it also solidifies the raw emotion and authenticity that "True Grit" displays so well. There are a number of scenes that Burwell is able to wonderfully match the emotion. The music, much like the story, is written to Mattie and her adventure. I loved how Burwell would bring about emotions that came from the perspective of a wide-eyed girl in dangerous Native American lands versus a score that came from the weathered point of view. There is a very innocent nature to the music and I was thoroughly enamored by it. Cinematographer Roger Deakins once again delivers a stunning piece of film. Deakins knows how to frame sprawling landscapes like none other. His work on films like The Assassination of Jesse James by the Coward Robert Ford and the Coen's No Country for Old Men he's proven his eye of western settings. With 'Grit' he has nearly the entire film to play with wide open settings and his selections are marvelous. The work in tight spaces is also pretty gripping. Some of the reactions he captures around the campfire or within a log cabin are highly memorable. My favorite sequence however comes from our first look at Rooster Cogburn. Shown through Mattie's point-of-view, Deakins does a magical job of introducing the illustrious Marshall in a very notorious manner. Previously mentioned is the manner in which "True Grit" feels authentic. A substantial aspect of the authenticity is the invisible supporting cast throughout. Outside of Matt Damon, Josh Brolin and Barry Pepper, there are no recognizable faces. All of the supporting cast members look and feel as if they were taken directly from the past and placed into the drama. Of the more notable names Barry Pepper is tremendous in his brief role. His scenes opposite Bridges are unannounced and emotionally stirring. Matt Damon is also polished as the Texas Ranger LaBoeuf. Some of the best dialogue exchanges happen when Mattie, LaBoeuf and Cogburn are on screen together and the actors all do impressive jobs of delivering all of the hilarity with wit and reverence. This brings up a good point of how funny "True Grit" is. The film is serious in nature however the Coen's have lined it full with humor. The Coen brothers are no strangers to comedy or drama, but they have a genuine ability to bring the two together seamlessly. Some of the comedy may fly over the viewers head, but only because they are not as use to the language being used. Just like in The Odd Couple with Felix and Oscar throwing put-downs at one another Cogburn and LaBoeuf do the same. Even Mattie herself has a quick tongue throughout 'Grit' giving off numerous lines of dialogue that provide both a sting and a laugh. This word play again is something that helps me to hold Joel and Ethan Coen in high regard. They are masters of the English language. 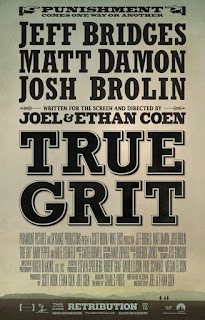 In the end "True Grit" is one of the best films of the year. It is a simple story that has miles of heart and emotion within it. It is a journey of a little girl just as much as a journey of a weathered old man. It is a story of retribution and a story of compassion. It is a story of will power and a story of determination. It has some of the best performances of the year while also housing some of the best dialogue penned this year. It is a complete film that illustrates precision from every angle. The Coen brothers are my favorite directors and this film is just another outstanding example of why. Great post and commentary. This was one respectable movie in a host of ways. However, the Coen's occasionally have difficulties with endings - perhaps they are cut off; but this, similar to Burn After Reading, seemed to be lopped off at the end. Also, they built a great movie - but it is all around the issue of revenge, and perhaps losing an arm is justice, or perhaps not. Perhaps being an old made is the penance for this; however, it irked me that such wise, moral filmmakers (who are often quite moral) would not address the revenge more considerately.